Falkirk district has seen the biggest rise in recorded crime of any of Scotland’s 32 local authority areas in the past year. Reports of sexual crimes made to police in the region shot up by just under half in 2017/18 compared to 2016/17, while the number of fire raisings and vandalisms, non-sexual offences and crimes of dishonesty recorded also increased. Latest Scottish Government figures show 14,627 crimes and offences were reported in the area during this time — up by 15 per cent on the previous 12 months. There were 454 reported sexual crimes, an increase of 45 per cent. The number of non-sexual offences recorded stood at 215 (up by 9 per cent on the year before), while there were also more — 1666 — fire raisings and vandalisms flagged up to police (a 17 per cent rise) and 2622 reports of crimes of dishonesty (an increase of 6 per cent). Reports of ‘other’ crimes went up by 22 per cent to 1730. The rest of the total was made up by 4430 miscellaneous and 3510 motor vehicle offences. Although Falkirk district saw the largest increase, there were also rises in recorded crimes in 13 other council areas, including in Edinburgh where the number jumped by 11 per cent. This year is the first that recorded crime has gone up nationally since 2006, with 244,504 instances being reported to police in 2017/18. The statistics also showed that the police clear-up rate for all recorded crime decreased slightly from half to 49.1 per cent. 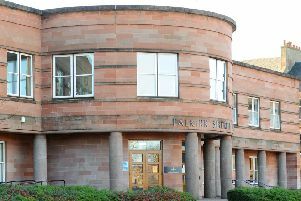 In the past decade, however, the recorded crimes have been tumbling and are down by 29 per cent in Falkirk from 2008/09. But the region is still below the 35 per cent national average and behind 25 other local authority areas which have seen greater reductions in reported crimes.